Code Dependency is one of Kat and Ana's Microgames in WarioWare: Smooth Moves. It returns in WarioWare Gold as one of Penny's microgames. 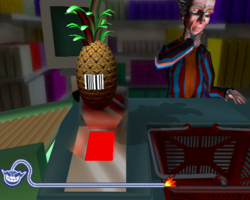 The player should rotate the Wii Remote so that the object's bar code is facing down with the scanner. As the levels progress, the item becomes more expensive. 1st level difficulty: The player scans a simple object. 2nd level difficulty: The player scans a more complex object. 3rd level difficulty: The player scans an awkwardly-shaped object. 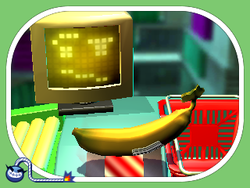 In WarioWare Gold, the player has two objects to scan. This page was last edited on October 12, 2018, at 20:32.